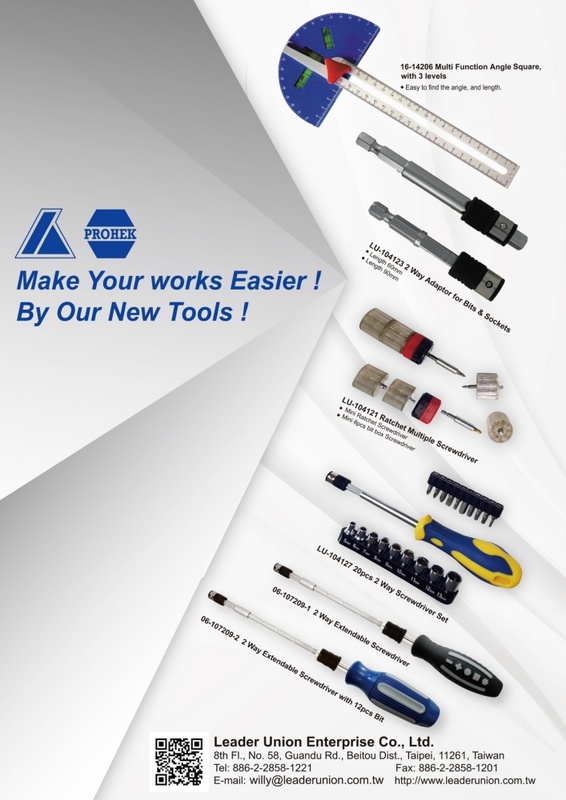 In the past 33 years Leader Union Enterprise makes various hand tools that are trusted by buyers in quality focused markets in France, Germany, Italy and the UK. But we don't just make any ordinary products. Our screwdrivers, for example, are made with patented reversible shanks that have uniquely designed tips. With a Phillips, Pozi drive or flathead tip, each end turns five different screw sizes without slipping. Our R&D staff members, are with years of experience, design our items with materials that provide better durability. Competitors commonly use inferior chrome vanadium in bolt-removal sockets, but we use chrome molybdenum which gives our tools greater tensile strengths. And our ergonomically designed tool handles and shafts are fashioned with Taiwan-produced S2 steel for added durability. With over 25 years of design and production experience, we'll create the perfect hand tools for your customers' homes, garages, and gardens. Hence, if any comment, please feel free contact us anytime.